Taught climate dynamics in Germany using C-ROADS (formerly called Pangaea) today from my desk in North Carolina, USA. Using GoToMeeting to send the image of the model on my computer screen over to Germany, 20 modeling students of Professor Martin Welp at the University of Applied Sciences at Eberswalde spent 45 minutes choosing scenarios over the phone and watching the results in C-ROADS (interface above). I was surprised how well such distance learning can work — based on their responses, they seemed to really see what it is going to take to stabilize the climate. More comments from students are below. I wanted to thank you for providing us with the opportunity to see how a well developed model can influence not only the public, but also students involved in mitigating climate change. One aspect that I really like about this model, was the fact that it is an open-source model. I think this is really unusual, but unusual in a good way! 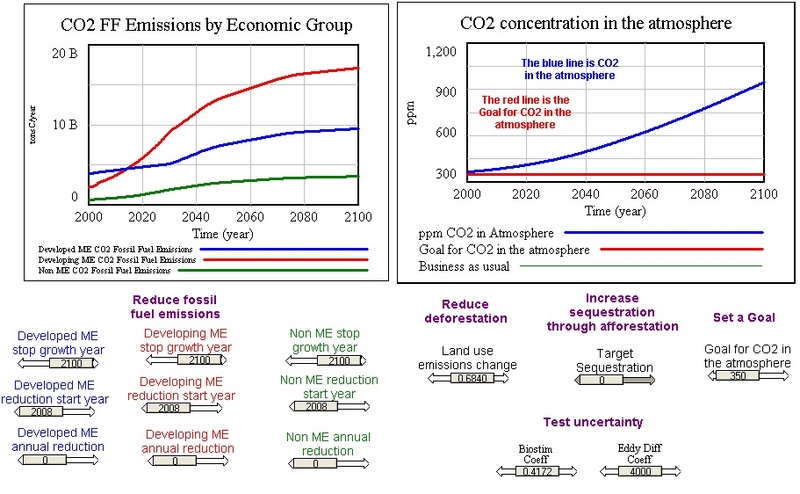 Thanks for your presentation, it was very helpful to see instantly what our decisions will do to the climate. I would recommend you to do this kind of presentation with other institutions, especially with our political decision makers. Even though our connection via phone and internet could have been better (a bit slow) but even so we greatly enjoyed it. If at all possible, it would be intersting to see what happens to our climate if you’d include the global dimming effect and that at certain temperatures the tripping switches (permafrost etc.) kick in. Probably scary but possibly a real effect that should not easily be disregarded. However, I understand if you leave the model as it is. It’s a good model to show the necessessity of immediate action and how vast our action must or should be. Great to learn about the initiative at the University of Applied Sciences in Eberswalde. The web technologies like GoToMetting, Yugma or DimDim (the last two ar free/open source) enables us to let knowledge flow back and forth around the world. Mostly questions on one side of the globe are answered whereas the other one is seeking for a solution. Tried to do a similar thing for learning for a recent WPI SD class and yet people are not familiar using it, especially as there is no instant, concret measurable benefit (which surely comes quite fast as learning improves even faster:-)). Looking forward to seeing more such collaborations. It is a real starting point to further digging deeper into the topics. Good going! It is nice what one can achieve without travel. In response to Ralf’s comment about benefits, I see multiple. It avoids what lean folks call “travel muda”: the time to switch from one task (or one client) to another can be measured in minutes or seconds rather than in hours or perhaps days. It lets you work with all the resources of your office at your fingertips (unless you’re working from your nearby wifi hotspot!). It makes for richer communications among participants. That last perhaps deserves expansion. In a well-designed online event (even a synchronous one such as you described), you can have multiple channels of communications that don’t interfere. You can be talking, students can be asking questions, students can be answering their own questions, or a colleague of yours can be answering questions, and you or your colleague can be taking care of administrative issues that arise, all at once. Because so much of what we do in face-to-face settings is audbile, we’re limited to one of those tasks at a time. I remember doing a workshop about five years ago in Reno with two other very good presenters. As much fun as it was to be working in the presence of real, physical people (a rarity for me), I couldn’t help but notice how hard it was to try to approximate what I routinely saw and did in similar online events. It’s cool, isn’t it? It also would seem to emit fewer GHGs. For various reasons, I’ve been working remotely most of the time for the past 9 years. One of my clients, HP, has data for at least one series of courses that indicates that virtual training felt _more_ personalized by the audience and was rated higher than equivalent face-to-face training, at least using the approach they used and taught me. I remember teaching a face-to-face workshop some years ago after a long series of purely online work. There were three of us leading the workshop, and it was great fun working together in person and interacting with the participants. Yet I recall feeling terribly constrained in the actual event by the communications bottleneck. In virtual work, there are typically multiple communications channels one can use amongst participants, support teams, and facilitators; in a face-to-face event, everyone is pretty much constrained to sharing the same audible airspace, so only one person can talk at a time.